Home Gamemoir Classics	Keyboard and Mouse vs. Controllers – What’s the Best Way to Play? 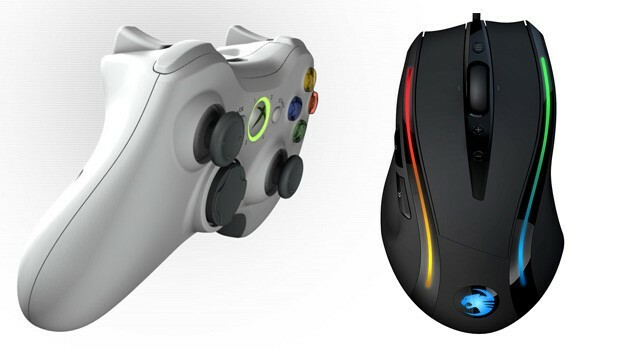 Nick D. looks at the age old argument – what’s better: a controller or the keyboard and mouse? As long as gamers have been separated into console and PC gamers, there has been a veritable war between what input device was better: the controller or the keyboard and mouse. Because gamers as a whole like to fanboy out on things, some gamers have taken this too far, and some others seem to associate the input device with their platform of choice. Today, I’d like to take a look at the advantages and disadvantages of the two major competing input devices as well as a brief look at what we’ve been presented so far with the Steam controller. I think it’s important to state outright that this is not a discussion of whether PC gaming is better than console gaming. There was a time where any comparison between controllers and keyboard and mouse input devices would be tantamount to taking a side between platforms. This is not the case anymore. PC gamers use controllers just as much as console gamers, and multiple consoles have allowed gamers to hook up keyboards and other alternative input devices for convenience. Let’s start with the keyboard and mouse first, since it has changed the least over the years. The keyboard and mouse are not designed for video games. They were created for general PC use. So instead, video games have been designed around them. The problem with not being designed for video games is that there has been no evolution in the devices, pushing them towards a more efficient gaming purpose. This brings us to gaming mouses and gaming keyboards. There is a wide variety of premium items available for PC gamers that were designed to push this input device towards more of a gaming purpose. However, as with most things PC, these premium devices vary wildly. Accordingly, my comments on the keyboard and mouse will be applying to the standard setup, which most gamers will be running, and not some premium model that might have a hidden feature I’m not aware of. There are simply too many niche products to take into account, and my own experience with them haven’t left me too impressed. The real beauty of the keyboard and mouse is the mouse. It offers a level of precision that is above anything I’ve seen in a rival device. However, the value of this precision varies from genre to genre. First person shooters (“FPSs”) are the most obvious genre advantaged by the precision of the mouse. This makes sense as FPSs are, at their core, a baby of the PC, and thus are well-tailored to the mouse and keyboard device. Since FPSs rely on pinpoint precision in order to function properly, the mouse is the best tool. It is such a superior tool that FPSs are designed with the mouse as its primary input device and later adapted to fit controllers. And then the controllers require a varying level of auto aim in order to make them competitive in the slightest. If you are interested in buying a mouse for gaming, but you’re left handed, it may be worth checking the left handed gaming mouse out. Precision is also important in strategy games, both real time and turn-based. With turn-based strategy games, the mouse is important to quickly and accurately navigate a huge variety of menus and be able to interact with the board at any location at a moment’s notice. Real time strategy games like StarCraft 2 require the mouse to play because these games are based entirely around speed. A controller simply cannot match up. In fact, I am of the firm opinion that, with regards to both turn-based and real time strategy games, this is the one genre that is simply incompatible with controllers. It’s been tried, but games like Civilization Revolution, and Halo Wars have left a lot to be desired, and are clearly mere shadows of the greats of the industry. There are genres, however, where a mouse adds little. Unfortunately for the mouse, these genres make up the vast majority of gaming. Genres such as adventure games, racing, action, and modern RPGs don’t require a precise instrument. These genres tend to relegate the mouse a form of broad camera control that simply doesn’t require micro-precision to function competitively. Even third person shooters are rarely of the same competitive scene as to provide much of an advantage to the mouse. In fact, with many third person shooters, the game is designed around auto aim, putting mouse inputs at a strange disadvantage. This doesn’t make the mouse inferior to the controller in these genres, but it strongly diminishes the advantage precision brings. Next we move to the keyboard. I have little nice to say about the keyboard. Its primary advantage is the fact that it provides the gamer all the hotkeys they could ever want. In addition, it is invaluable in MMOs where mics aren’t commonly used. However, for its primary purpose – movement – it is a poor tool. In contrast to the precise mouse, the keyboard is a completely blunted instrument, and this matters in a lot more genres. Precision of movement is crucial in nearly every genre, while precision of the camera is only vital in a handful. A few feet in any direction can make the difference between life and death in countless video games. You really don’t want to be off even a millimetre from your mark in a game like Dark Souls, and analog input is simply superior in this way. Where keyboards really thrive is in the MMO environment as, traditionally, MMO combat doesn’t require precise movement or positioning, while also needing huge numbers of macros. However, that’s an exception to the rule – keyboards aren’t a very good gaming device. The controller is a completely different beast than the keyboard and mouse. Unlike the PC-born device, the controller was made for a purely gaming purpose and has continued to evolve over time. At one point in gaming history, before analog sticks were added to the standard controller, the disadvantage of the keyboard mentioned above was less obvious. After all, the d-pad of most controllers is hardly more accurate than keyboard keys. However, the controller has evolved, substantially, with every console generation. The difference between the dual shock 3 and 4, for example, is night and day, the same could be said for the jump between the clunky original Xbox controller to the Xbox 360 one. To simplify the issue, we are going to focus our discussion to the PS4 and Xbox One controllers as the standard. While the Wii U’s gamepad is good, it is not representative of the modern controller. The big advantage to the controller is convenience. This goes hand in hand with its evolution as a device. Controllers have now been designed standard with the human hand in mind. It is set to contour around effectively and provide ready access to all core buttons. This allows for faster and more accurate inputs than the keyboard, which was not so similarly designed. For games with more complex controls, this is a rather large advantage. For example, in the Devil May Cry series, the core combat revolves around the input of a huge variety of special moves at a moment’s notice. The controller was designed to allow for a rapid change of inputs in a convenient and quick way. This gives it an advantage to the keyboard in many genres. However, some genres don’t require many inputs. Many hack and slash games like Dynasty Warriors revolve around only a few button inputs. In these games, the controller’s button input advantage is less pronounced as a click or two on the mouse can provide the same level of input speed. The analog sticks on modern controllers are also very convenient. Though the camera control stick is inherently less precise than the mouse, there is more of a connection between camera controls and movement controls. On the keyboard and mouse, you are using your wrist on one hand for the camera and three fingers on the other for movement. On the controller, you are using your right and left thumb. This allows for better coordination between camera and movement. The movement itself is far superior to the keyboard. The controller thrives when degrees of movement are required, either from stealth games where movement must be deliberate, or high intensity games, including FPSs, where a single wrong step could lead to your doom. The Steam controller is said to bridge the gap between the keyboard and mouse and the controller. I have not had an opportunity to use one yet, and thus I must reserve the bulk of my judgment. However, what I’ve seen so far has left me incredibly unimpressed. The Steam controller seems to combine the weaknesses of both types of input device, while doing away with their strengths. It has two trackpads for your thumbs, but these track pads cannot be as precise as a mouse. They may allow games such as Civilization V to be playable with it, but that doesn’t mean much when it is infinitely inferior to the mouse. Same with any competitive game. I wouldn’t trust these track pads in the cutthroat online environment of StarCraft 2, for example. Similarly, it takes away the keyboard’s hotkeys and typing ability, thus stripping away the meagre advantages from the keyboard. Lastly, in its most current design, the buttons are all at awkward places, and are too close to the track pads, meaning slips could completely screw with the camera while you’re reaching over. In many ways, the Steam controller acts as an example of the strengths of both the keyboard and mouse and controllers because it does such a great job at exemplifying all of their weaknesses. The mouse provides unparalleled precision and the keyboard provides versatility in custom hotkeys and macros. The Steam controller offers neither. The controller provides ease of button inputs and better coordination as well as movement controls. The Steam controller only grudgingly added buttons in, then they put them in awkward places, thus ruining any ease of use they may have had. In terms of what is superior – the controller or the keyboard and mouse – the answer is simple: both of them and neither of them. These are tools, and like good tools they have specific uses. Neither is superior in all situations, but each thrives in specific environments. Playing an MMO without a keyboard is doable, but clearly not optimal. Similarly, action and adventure games benefit far more from the controller’s inputs and movement controls. Each is useful, but not always. And that’s glossing completely over personal preference, which, realistically, will make the biggest difference for gamers choosing between individual input devices. In the end, both inputs bring something to the table and neither falters at every occasion, which is a relief since we, as gamers, all have a horse in this race. I’ve got my PC hooked to my TV. I much prefer controllers even with FPS unless its an old school FPS or a source engine FPS. Other games like FTL and other RTS need a mouse. I just like having a controller its so much easier than a keyboard. I was trying to play a MMO recently and I thought wow there really need to be 100 key bindings? Why do I need that much when its just easier to be on a controller? Controllers are comfy, mouse and keyboard are precise.